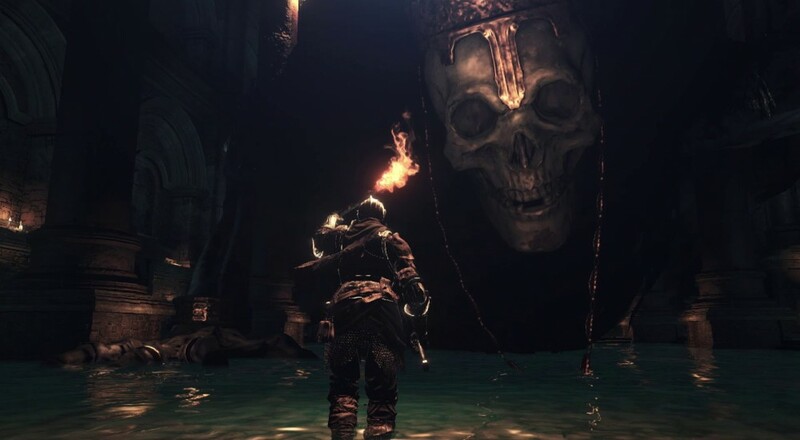 The grim universe of Dark Souls might best be described as "fantasy horror," though murdering a shambling undead for the trillionth time might diminish some of the "horror" element and turn it into boring ol' fantasy. That skeleton with a sword won't stay scary forever; he's gotta go to Spook School and learn some new methods of fright. From Software, not to be outdone by their previous entries, set out to up the terror quotient with Dark Souls 3. Check out the newest trailer. You've still got your undead dudes in armor that seem really upset you're hanging around where they passed out, sure. But you've also got an entire menagerie of grotesqueries and surreal situations that eat at the mind. "What does that thing look like under the mask? How can it bend that way?" Deep down you realize you're much better off not knowing. Aside from that gnawing fright in the back of your skull, what else? Combat looks closer to Bloodborne than previous entries in the Souls series, mostly in movement. It's fluid and quick, which isn't something I expect from a dude decked out in plate armor. Dark Souls was always so deliberate in the motions, where as Bloodborne focused more on dancing around the baddies before going straight for the jugular. Sure, it looks like more Dark Souls. Maybe a little sharper, maybe a little spookier. But for right now, I'm into it. I adore this series, despite the tears and swearing it always brings. No word on the co-op for now, though I'd put down a few dozen souls or so that you and your buddies will be charging into battle against the Skeleton Lord when this title hits.